Dancing with the Stars is starting soon. I know that there are a few fans here. 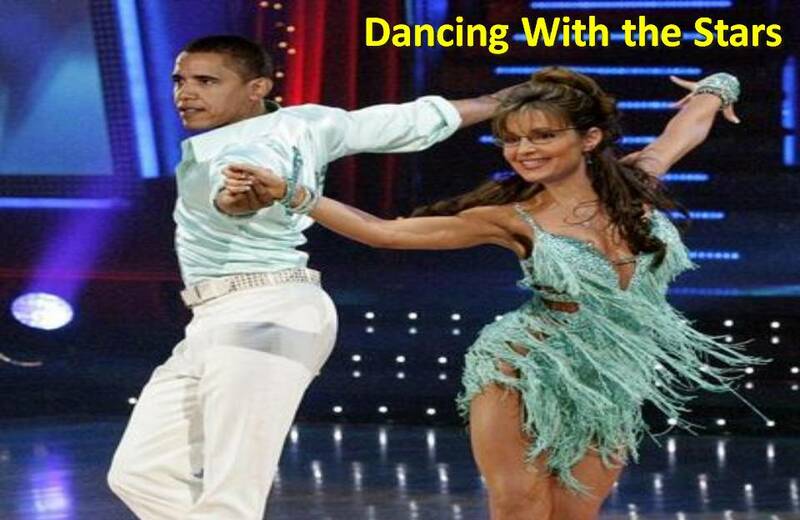 One Dance you will not see the contestants performing is the “Dance of the Moron”. And no you will not see this couple performing either. We laugh, but there really is a dance of the Moron that God says describes as the forbidden dance, one which He is Passionately Opposed to. The Dance of the Moron looks exciting and wonderful to other morons, but to God, it is very deadly. 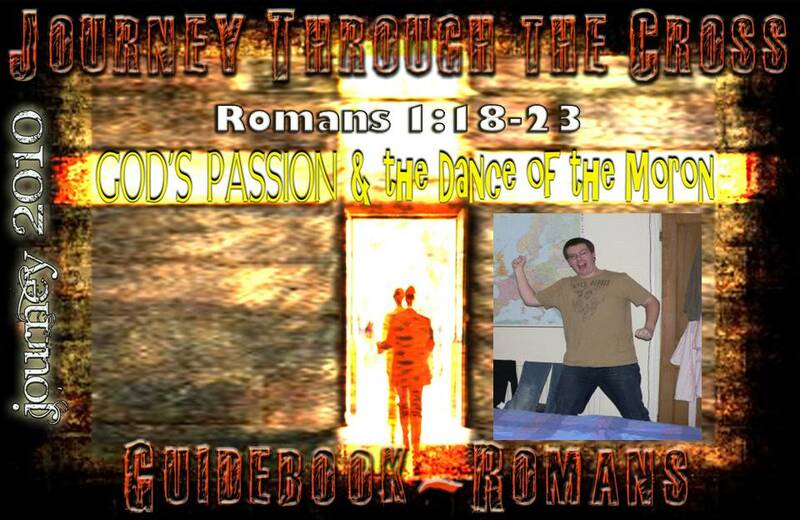 This Dance of the Moron is described in the verses we will look at in Romans 1:18-23. In Psychology. 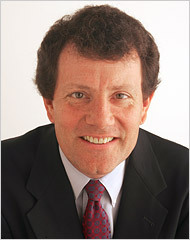 a person of borderline intelligence in a former classification of mental retardation, having an intelligence quotient of 50 to 69. God does not quantify morons by their IQ. 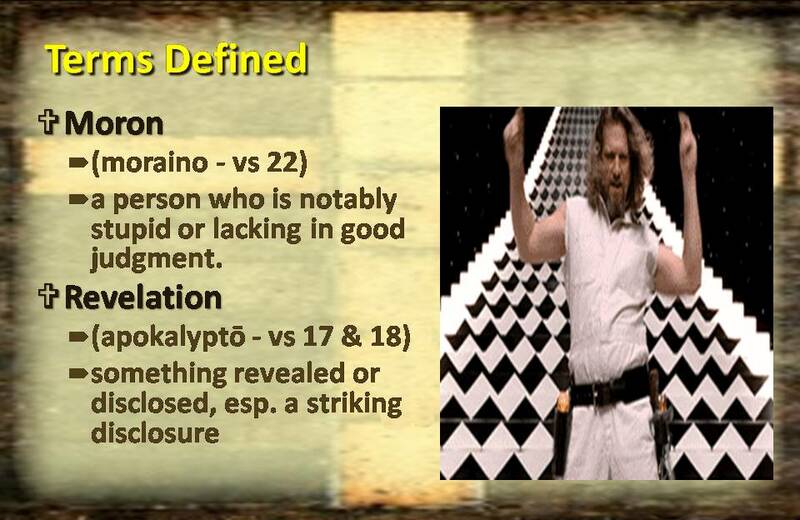 God classifies people as morons based upon how they respond to the next term we’ll define. God is the one who determines who is a moron or not. Something revealed or disclosed, esp. a striking disclosure, as of something not before realized. Why God Responds With Wrath? From Romans 1:18-23. 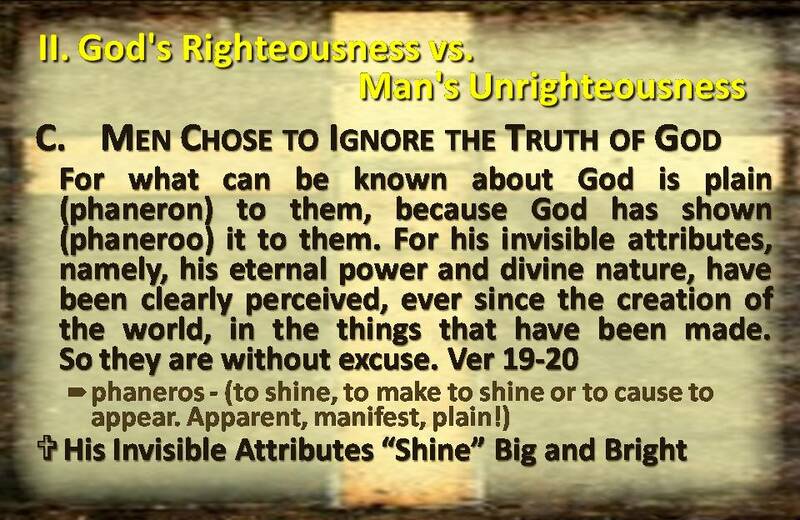 Verse 17 says “For in it (Gospel God) the righteousness of God is revealed from faith to faith. This Gospel that we saw last week, that Paul surrendered his life to, is revealed in the Greatest Power this World has ever known-the Resurrection of Jesus Christ. By faith in God’s Message, we see, we know, we possess the very Righteousness of God. Gospel God is opposed to all those who by intent or by ignorance or by stupidity refuse to Honor His Righteousness. 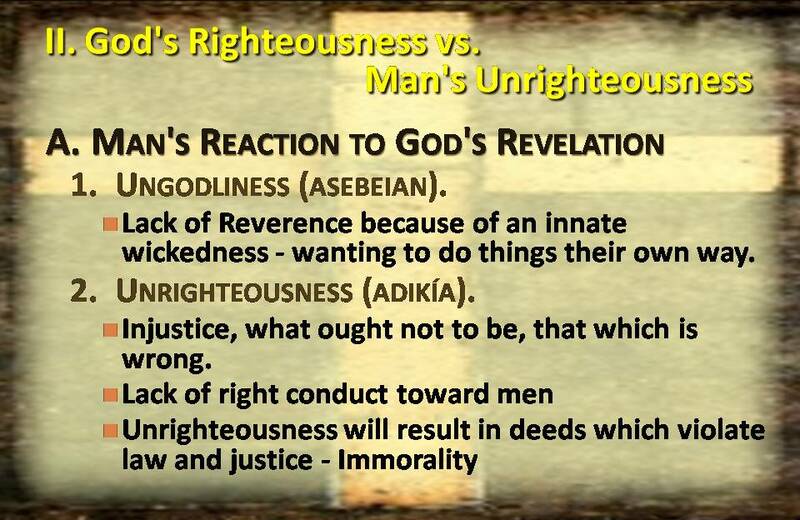 God is not content being Righteous by Himself. This World, everything that is in it, including you and me, God desires with all His heart to set it Right once again. He created it RIGHT, but sin happened. He has revealed His Righteousness to us, His way of setting it right again, and it is by FAITH that this RIGHTEOUSNESS can be ours. Jesus Christ has made everything possible, and we must simply life in FAITH in what God has done through Him. IN THE GOSPEL, God has REVEALED HIS RIGHTEOUSNESS AND HOW IT IS AVAILABLE TO US! Orgē is from orgaō, to teem, to swell. It is the temper of God towards sin, not rage, but the wrath of reason and law (Shedd). 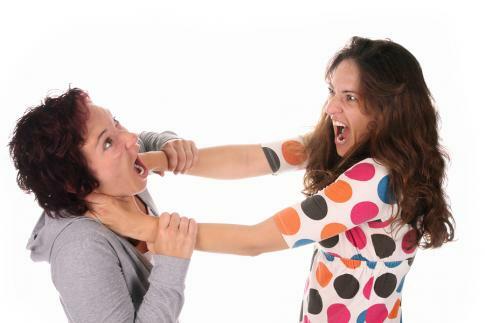 Instead of viewing ‘wrath’ as some angry outburst, we should see it as a passionate display of His Righteous character. The same way married couples respond to unrighteous threats to their marriage. God is not passive but active in response to sin. This attitude and exercise of righteous indignation against evil is no vice but a virtue which God perfectly displays against sin. God desires His Creation to Worship Him, to Walk With Him, and He jealously injects Himself into our life. Police will tell you that the most dangerous situations they often face are domestic conflicts. 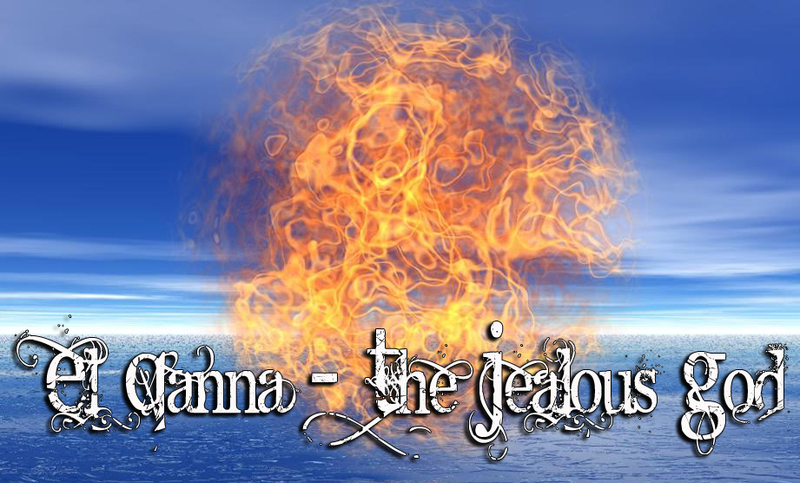 Passions and Jealousies ignite tremendous rage at times. PERSONAL WITNESS: One of the most dramatic things I have ever witnessed was as I was a freshman in Bible College at a Laundromat doing my laundry. It was Thursday evening, I was watching Kung-Fu. All of a sudden I hear a screeching of tires as a car slammed on its brakes. Into the Laundromat a gal comes stomping, screaming, “you been messin with my man. You better getta away from my man”. This other gal doing her laundry starts screaming back and before I know it these two women are down on the ground pulling hair, punching at each other, biting. Before long the police come and drag them away. Now, I don’t know who the guy was, but he obviously had ignited a lot of passion between these two women. That passion led to violence. 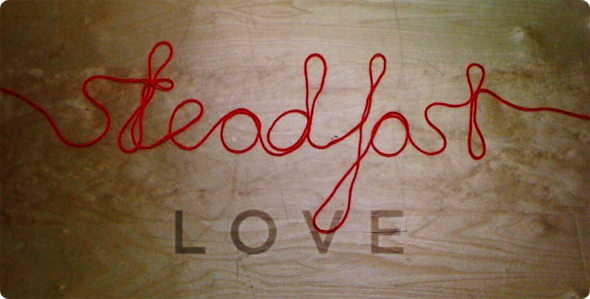 Their passion was based on their own selfishness. Because He is Righteous, he cannot tolerate people who deliberately turn away from Him, from His righteousness, and then declare their own! They are Morons to Him. God’s angry displeasure is against all morons, because THEY JUST DON’T GET IT, IN FACT THEY REFUSE TO GET IT. They simply keep on dancing the dance of a moron. The Passion of God is not an emotional outburst as people imagine. His desire is such that we know His righteousness, that we are Holy as He is Holy. When we are not, his desire for us is kindled to the point that He would do anything to get us to turn to Him. No exact form of judgment is specified; the present judgments of God are seen in a variety of ways–“natural” calamities, local disasters, etc. Whether or not you believe God had a hand in the natural disasters that have been so prevalent recently, and have been revealed from the heavens, the results have been that many people have turned to Jesus Christ. God has done so much for us, he is shouting at the top of HIs Voice, I am Your Creator, Your God. Why won’t you give your lives to me? Why do you insist on ignoring me, on living your own way? Why do you insist on being ungodly and unrighteous? Because of my Righteous desire for you, here is a taste of my Power. Wake up and turn to Me! 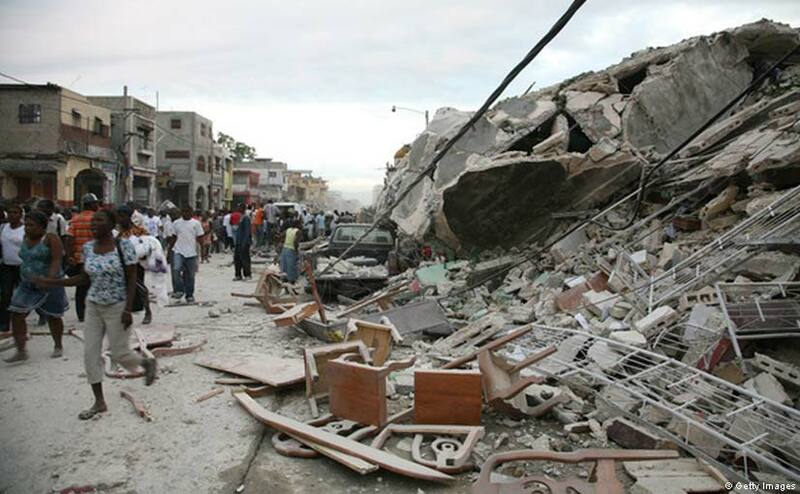 In Haiti: A reported 40,127 Haitians have made professions of faith in Jesus Christ since a major earthquake hit the impoverished nation in January, according to pastors and directors of missions within the Confraternite Missionaire Baptiste d’Haiti (CMBH). “Haiti is ripe for a spiritual movement from God,” said Craig Culbreth, director of the Florida Baptist Convention’s partnership missions department, which coordinates the work of the CMBH, upon his Feb. 22 return from Port-au-Prince. 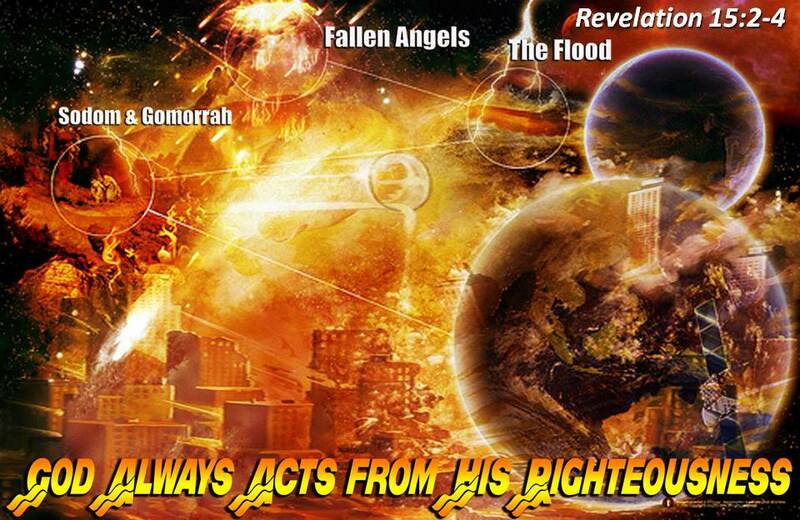 God Reveals Himself in His Righteous Acts, even though they may seem like wrath. 1. Ungodliness (asebeian). 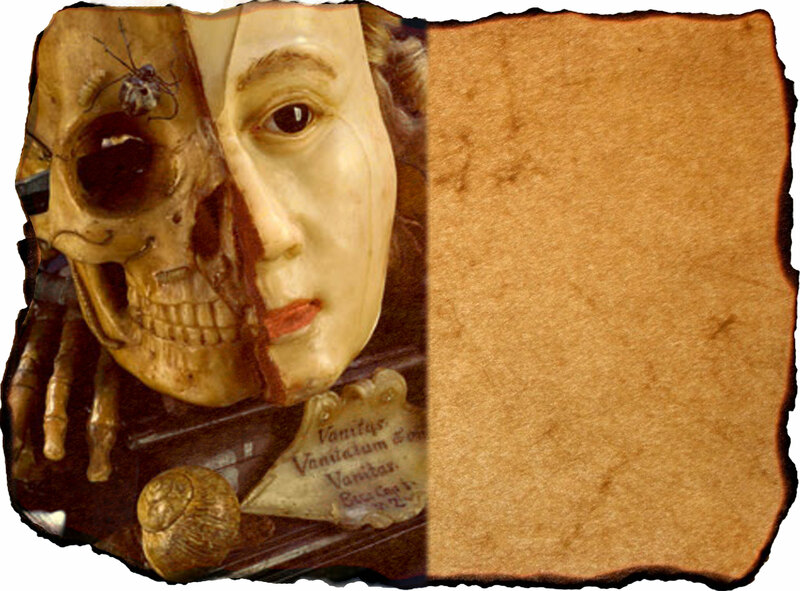 Lack of Reverence because of an innate wickedness – wanting to do things their own way. Lack of right conduct toward men, injustice This follows naturally from irreverence. The basis of ethical conduct rests on the nature of God and our attitude toward him, otherwise the law of the jungle (cf. Nietzsche, “might makes right”). 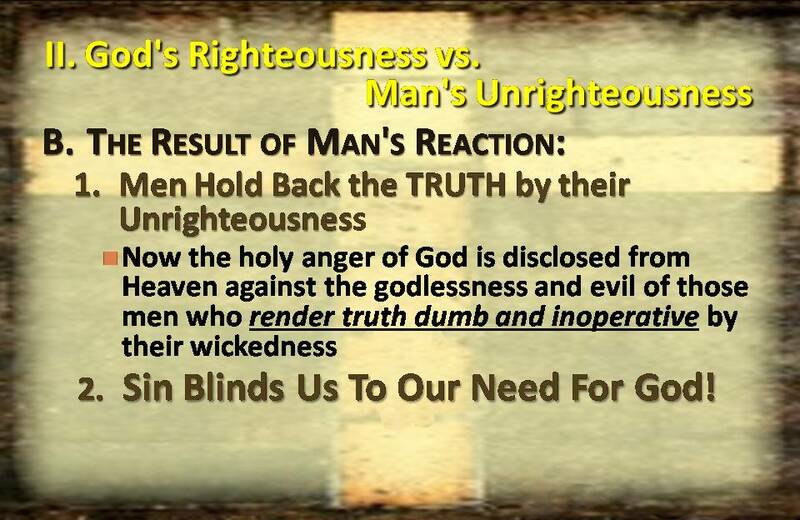 The conduct of men that is a result of their lack of reverence for God actually hold’s back God Truth. 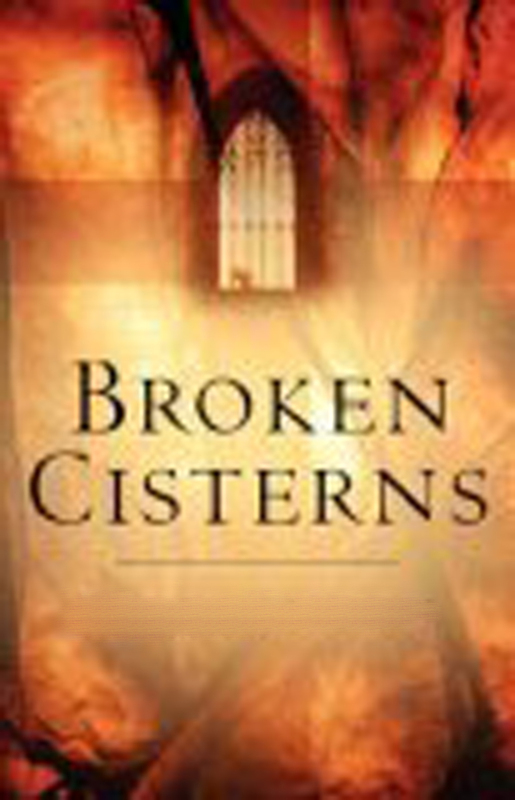 Just as disobedience caused Adam and Eve’s eyes to be opened to see their nakedness, so sin blinds our eyes to God! 2. Sin blinds us to our need for God! Men deliberately chose their own morality which leads to injustice, disobedience, partiality, greed, selfishness, and every kind of immoral behavior. That which can be known about God is phaneros – (to shine, to make to shine or to cause to appear. Apparent, manifest, plain – it is that apparent!) You cannot escape the obvious revelation of God! JBPhilips: It is not that they do not know the truth about God; indeed he has made it quite plain to them. For since the beginning of the world the invisible attributes of God, e.g. his eternal power and divinity, have been plainly discernible through things which he has made and which are commonly seen and known, thus leaving these men without a rag of excuse. Paul is speaking of what man can see in the created order because of the knowledge he inherently possesses as a creature made in God’s image. 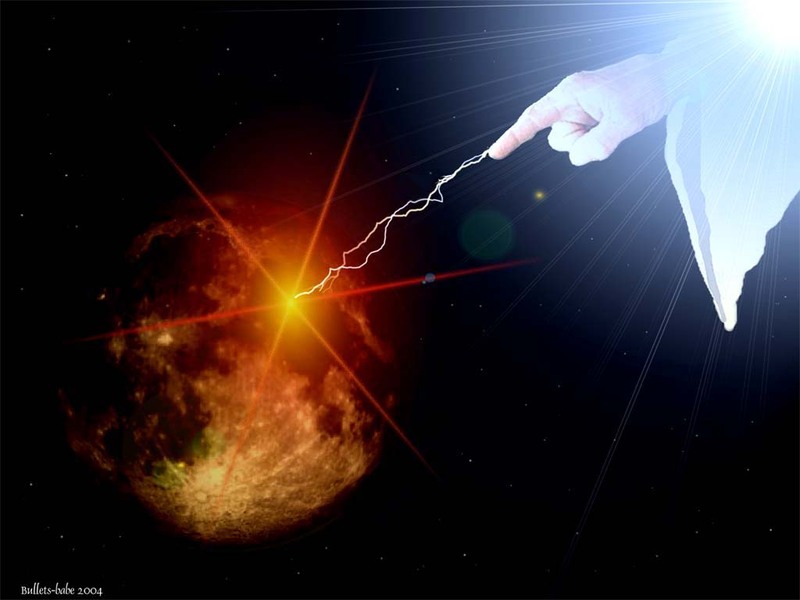 General revelation shows God as Creator! General revelation is the norm for society! General revelation is the means of condemnation! Even if Jesus had been preached to them, they would have rejected Him, because they reject God Himself! III. 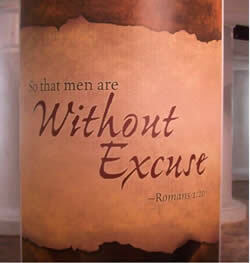 Why Are Men Without Excuse? 1. They know (ginosko) there is a God. to know by personal experience. 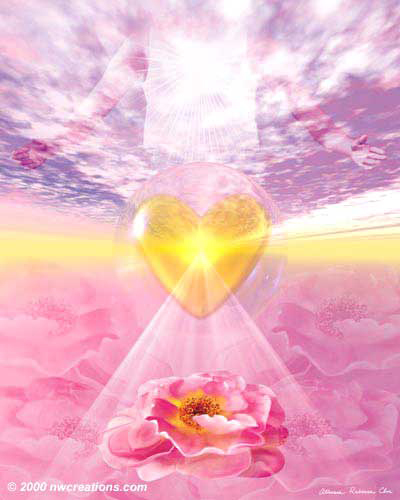 En autois suggests intuitive knowledge, the sphere in which God is known (phaneron), our heart and mind. Murray combines the two ideas: God is known “in them” (en autois, v.19a) because He revealed Himself “to them” (autois, v.19b) in creation. This knowledge of God in man is a result of God’s own self-disclosure. All men possess clear (albeit limited) knowledge of God, for He has made Himself known to them. God made us with the capacity to recognize that there is a God, that this God created us, designed us, and desires to have a relationship with us. 2. They Refuse or Fail to Render Proper Glory to God. 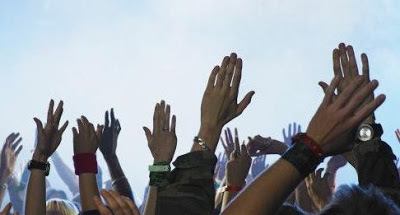 Proper Glory means we seek to Worship Him with our substance, with our hearts, with our hands, with our lives. Whatever we do we do it with the Glory of God in Mind! 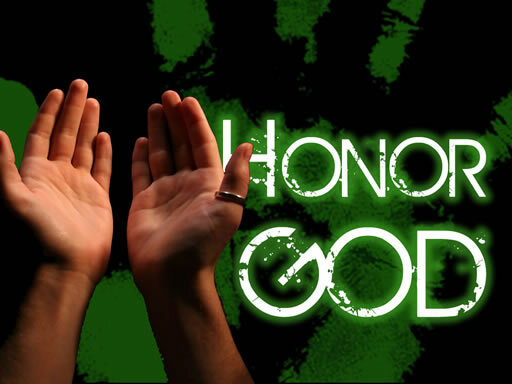 How many people would murder, steal, lie, cheat if they lived to give proper Honor to God? 3. 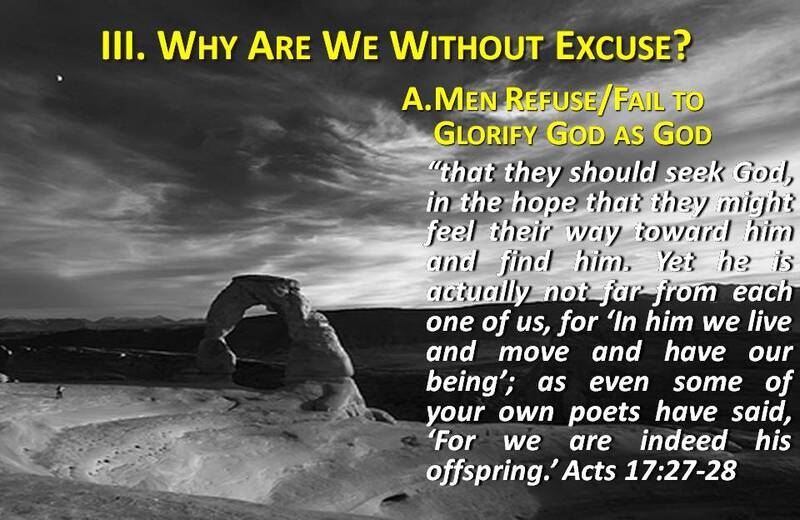 How Does Mankind Refuse or Fail to Give Proper Glory to God? Act like He doesn’t exist. Act as if He doesn’t exist. We are not just talking about Heathens, Hooligans and the Hell-Bound! God’s Law had amazing provisions for care of the blind and lame, as well as taking care of refuse and trash. Do You Tithe, do you treat your money as your own? Became vain” is mataioō. The noun is mataios, “devoid of force, truth, success, result.” The word “vain” today means “proud.” The Greek word did not have any idea like that. 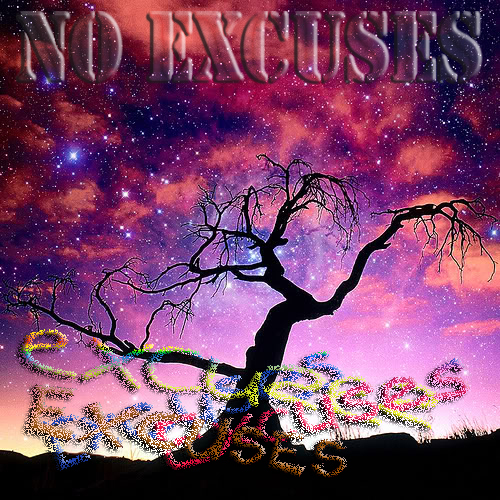 Mataios refers to that which is in vain, futile, that which is without result or success. It refers to the unsuccessful attempt to do something or be something. It refers to that which does not measure up to that which it should be. 1. In scriptures becoming vain usually means to become corrupt and wicked. c) Look at all that I have accomplished. 3. Man attempts to become something, and instead becomes NOTHING! 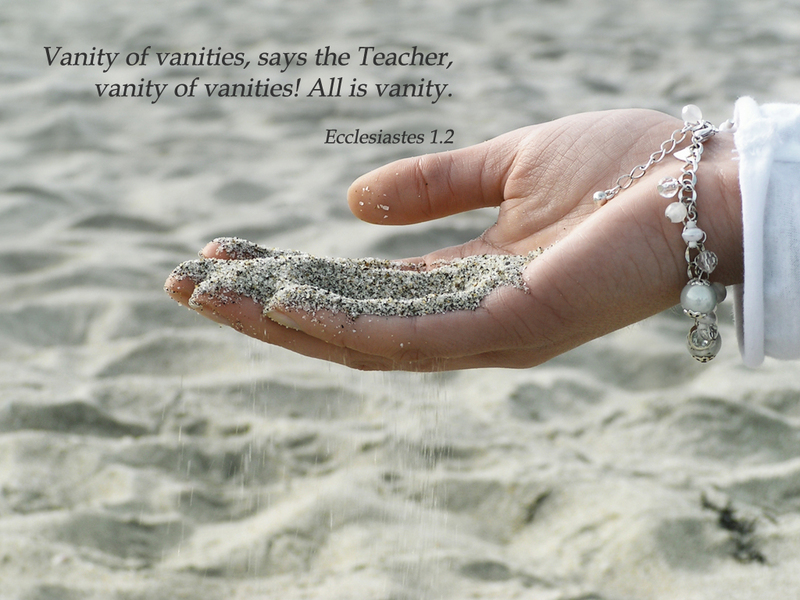 Solomon said, “Vanity of vanities, all is vanity.” That is, “futility of futilities, all is futile.” All that he tried was futile, unsuccessful, in giving him complete satisfaction. Men, in refusing to recognize the true God, entertain foolish and wicked thoughts of who God is. The thoughts of men were continually evil before the flood. They become foolish in imagining there is no God. They become foolish and start worshipping other gods, idols, things, even themselves. Mental Disease is also the result. Their heart becomes darkened so they no longer have any insight into God. 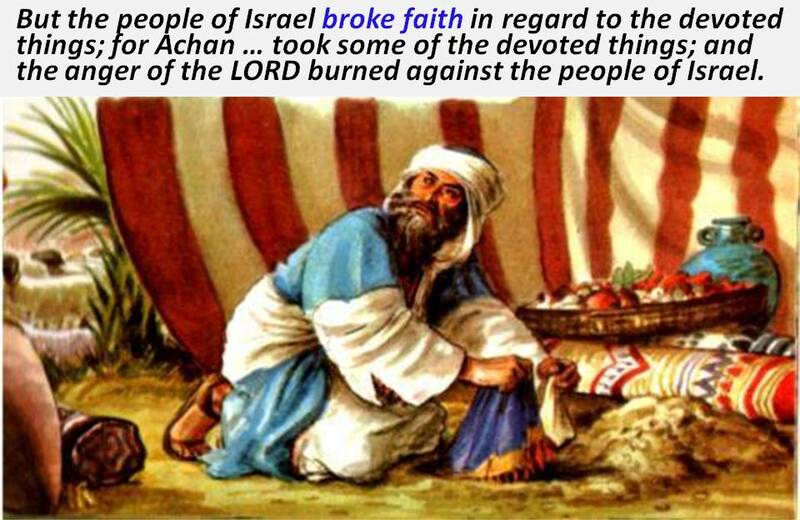 This is how the Israelites could be the way they were in the wilderness. In spite of all God had done and was continuing to do, they were clueless when it came to the need to worship and honor Jehovah God. God had Moses take the Jews the long way around Edom. It was desolate land, not plush and green like the many oasis in Egypt. Even as slaves they had a choice of food, stores they could go to, nice things they could buy. Water was plentiful. Clothing was beyond compare. The ladies could buy the latest slave fashions. They had nice homes to live in, stoves to cook on. Now they were forced to march in the desert, going who knows where. No stores, no variety of food. None of those Egyptian delicacies they had grown so fond of. All they had now was this Manna that they had to pick up off the ground. Water was scarce and had to be rationed. The heat was unbearable. They had to pitch tents all the time. No cushy commode to sit on and relax. You had to fight off the insects and wild beasts when you went to the bathroom. No fancy Egyptian makeup or Spa treatments in the wilderness. They got to thinking they were better than this. They deserved more! They started complaining against Jehovah and against Moses. 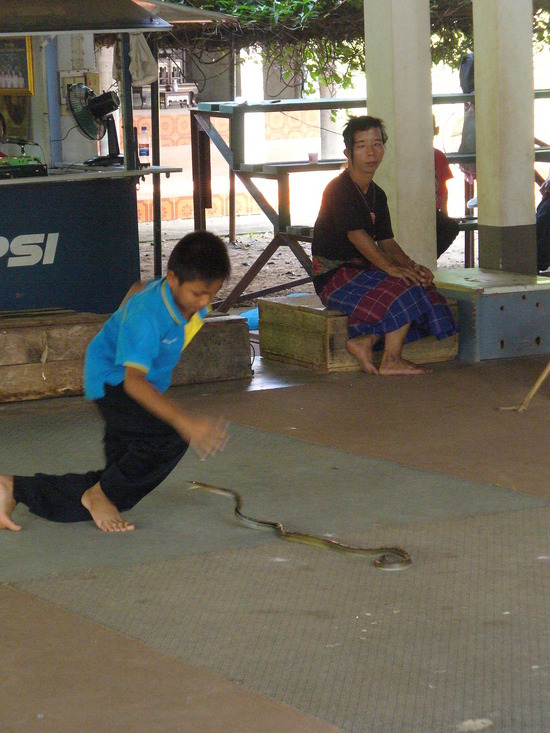 Have you ever seen someone trying to avoid an aggressive, striking snake? 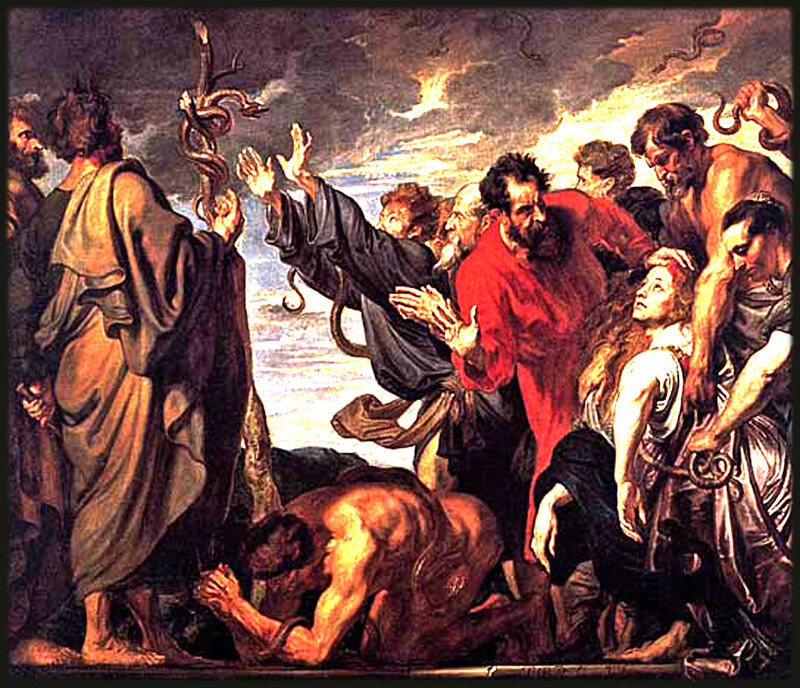 When the snakes started attacking, there was a lot of dancing going on. 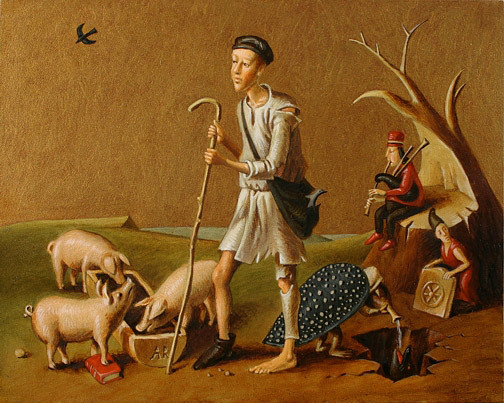 Paul wrote: Claiming to be Wise, they became fools-moraino. That’s that word we learned about a few weeks ago. Jesus said that salt can become “moraino” insipid, bland, useless, good for nothing. You start doing the moron dance, and then you dance around your idols, your stuff and you say look at all my great stuff. You start dancing around at a football game and say look at how great our team is. God says, “OK, you want to dance the Moron Dance, go ahead. Here I’ll help. How about an earthquake. How about a Tornado? Can you dance in a hurricane? How about some aggressive snakes? The Dance of the Moron is the dance of someone who refuses by intent or by stupidity to Honor God as God, to Thank God, and instead put themselves on the pedestal. They become moraino and exchange the Glory of God meant for them into something stupid and temporal like a car or a house or a football team or a soft pillow on Sunday morning. Or they create their own God, their own religion. What Can I Do? – Have a New Focus! 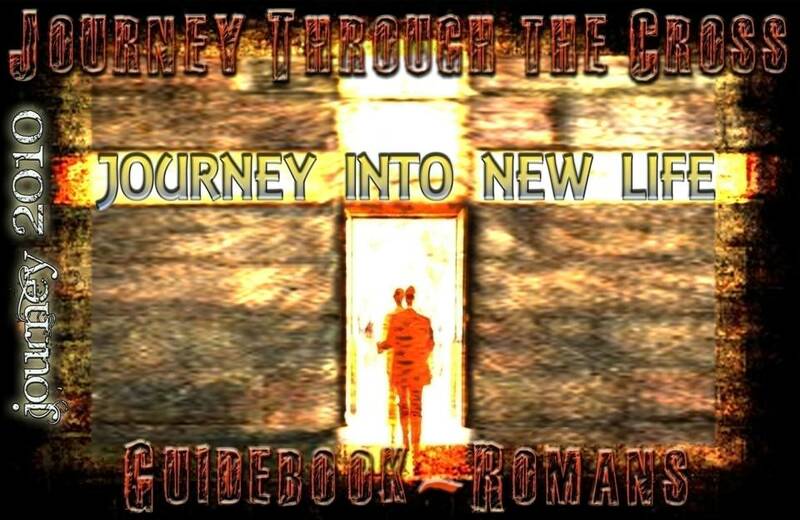 We think that Romans 1:18 – 32 applies only to heathens, gentiles, those that reject God. But if you read Scriptures, Christians can become darkened in their heart, carnal in their heart, fleshly. Christians can even do the Dance of the Christian Moron. You supposedly know better. You supposedly have been made alive to God. You supposedly have God’s Holy Spirit living in you? 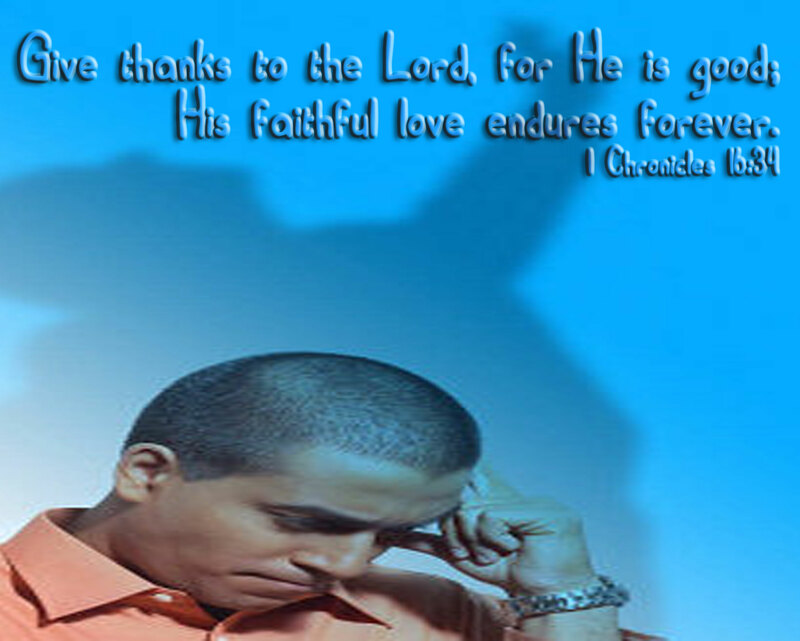 Why then are you not honor God, Honoring His Word, Obeying Him? Why are you robbing God? Why do you pay him lipservice, but go out and do what you want to do? Why are you so ungrateful to HIm? Why do you hold on to your money and your possessions like they are yours? Why do you pat yourself on the back so often, and think how well you have done. Could you heart be getting dark? Could your soul be getting hard toward God? Is that your leg starting to quiver, to move. Is that your arm starting to wave? 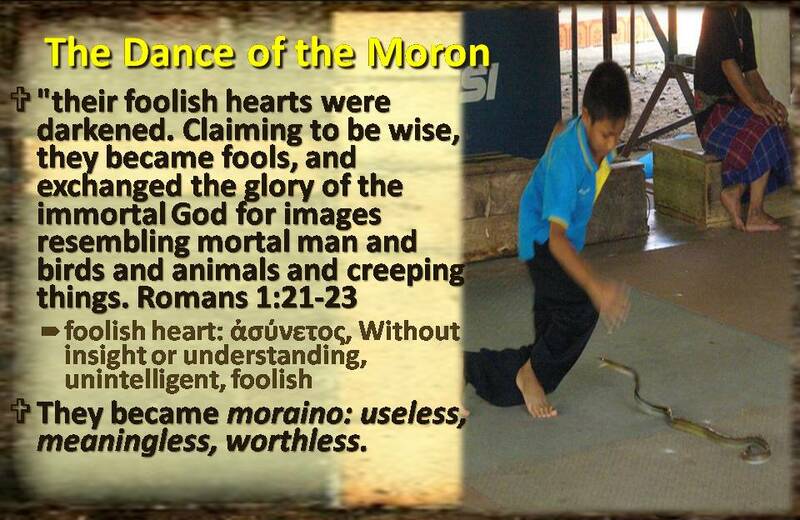 Christians can dance the Moron Dance as stupidly as any heathen. How do I stop? How can I become useful to God? How can I experience this Glory of God? 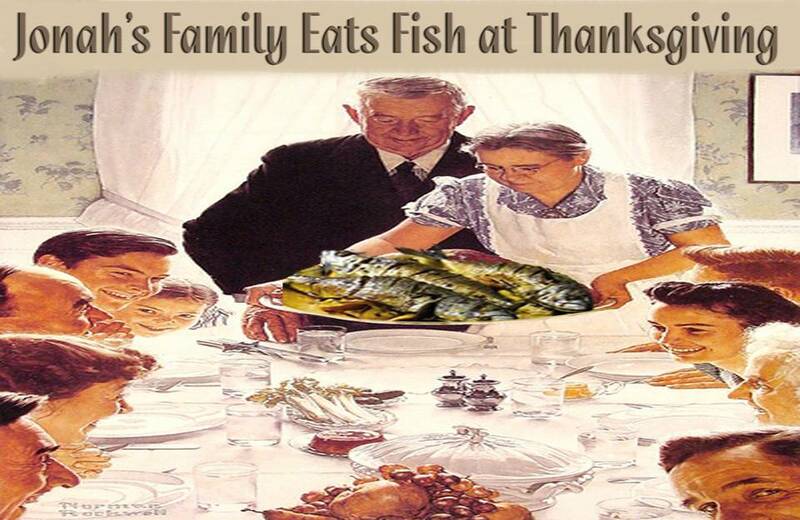 Why does Jonah eat Fish for Thanksgiving? In 1983 I took a trip to Turkey sponsored by the Overseas Private Investment Corporation, OPIC. It was a government sponsored trip to seek investment opportunities in Turkey. My last night I spent in Izmir having dinner with my interpreter and a business owner interested in doing business in America. 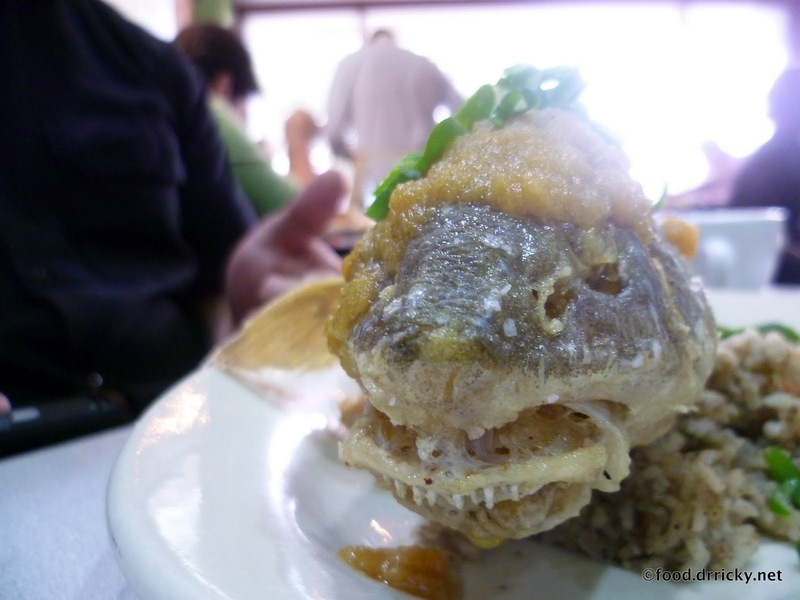 They ordered for me and out came this huge Black Sea Bass (whole) sitting upright on a potato concoction. 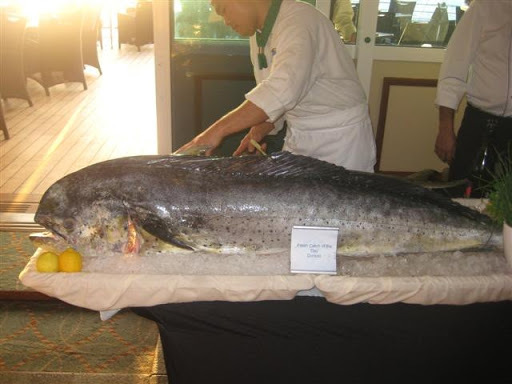 I ate the fish, but that night I got deathly sick, so sick I missed my early morning flight to Istanbul. 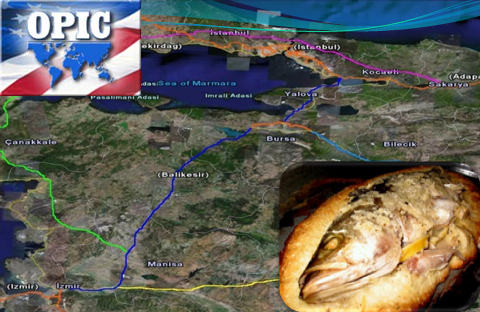 That fish gave me nightmares for several months, because it meant that I had to rent a car and drive 600 kilometers through at least three military check points, in unfamiliar towns and then into Istanbul late at night trying to find a place to stay. It was an exciting and terrifying experience to say the least. That is why I don’t like eating whole fish to this day. 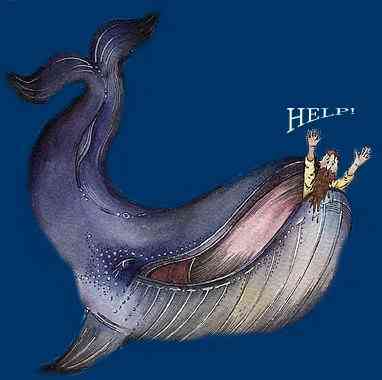 The book of Jonah relates a story that you are all familiar with, of a man who tried to run away from God’s will, and ended up being swallowed by a giant fish. Now if I had problems eating fish after my experience, I can just see Jonah being afraid to get on a ship or even go near the ocean or a lake. Every time he would hear a splash I can just see him running for cover. But when I read what he wrote in chapter 2, I know that isn’t the case. 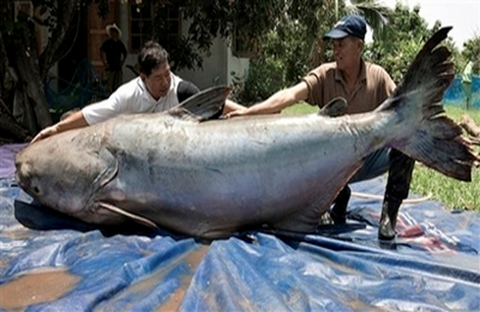 In fact from the Psalm he wrote, I know that every Thanksgiving, Jonah would eat the biggest fish he could get. Jonah says in his Psalm recorded in chapter 2: “But I with the voice of thanksgiving will I sacrifice to you” This he prayed while still in the fishes belly. 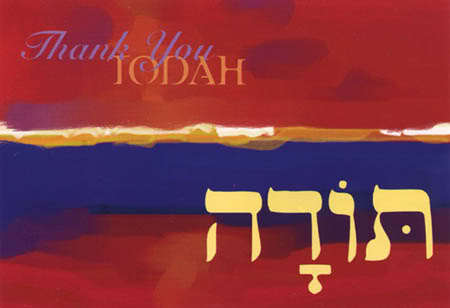 The Hebrew word for Thanksgiving has in view a Choir Singing Tremendous Songs of Praise, accompanied by a huge orchestra. People with SHOUTS of Jubilation! 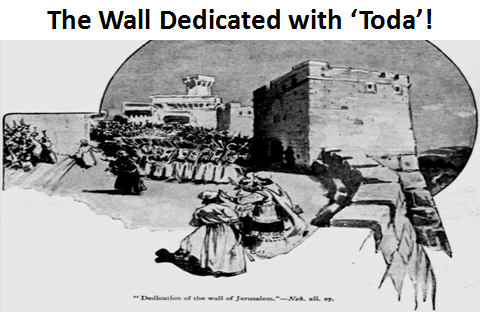 When Nehemiah dedicated the wall he had all the leaders get on the wall and had a huge assembly of Levites playing instruments and singing praises to God. This is the picture Jonah presented in his prayer while lodged deep in the stinking stomach of a huge fish! 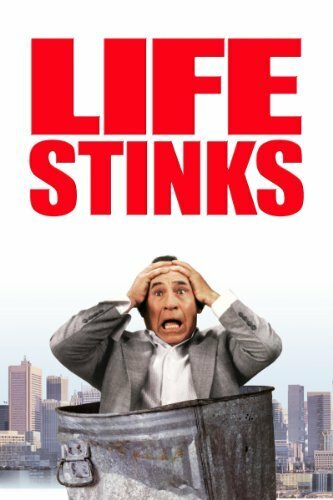 Now how was Jonah able to praise God while he was deep in the belly of a stinking fish? Because Jonah had a firsthand lesson in something which many of us are not familiar with. Would that our Thanksgivings featured such spontaneous expressions of Joy and Rejoicing over what God has done in our lives. Face it, most of our Thanksgiving meals consist of a few arguments over such and such, a short prayer of blessing, then maybe a forced “What are You Thankful For?’ and then the guys go and watch football or go to a movie or such like that. Even in my family I can’t recall spontaneous shouts of Joy over what God has been doing. 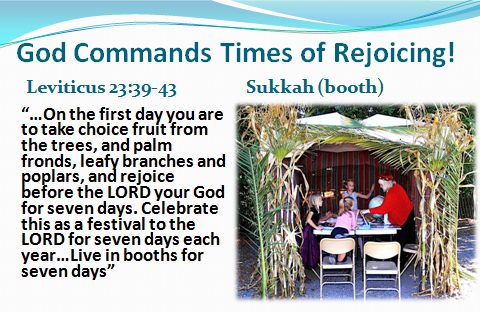 Leviticus 23:39-43 (KJV) Also in the fifteenth day of the seventh month, when ye have gathered in the fruit of the land, ye shall keep a feast unto the LORD seven days: on the first day shall be a sabbath, and on the eighth day shall be a sabbath. And ye shall take you on the first day the boughs of goodly trees, branches of palm trees, and the boughs of thick trees, and willows of the brook; and ye shall rejoice before the LORD your God seven days. And ye shall keep it a feast unto the LORD seven days in the year. It shall be a statute forever in your generations: ye shall celebrate it in the seventh month. Ye shall dwell in booths seven days; all that are Israelites born shall dwell in booths: That your generations may know that I made the children of Israel to dwell in booths, when I brought them out of the land of Egypt: I am the LORD your God. 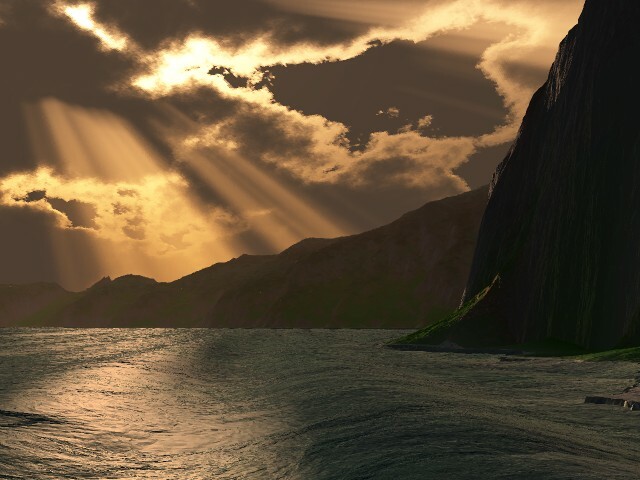 The story of Jonah is so appropriate at the time of Thanksgiving, because it addresses the conflict that most of us experience at this holiday time. This is the conflict we have between our experiences with the Sovereignty of God and the Joy (or lack of it) we feel in our Soul! The sovereignty of God may be defined as the exercise of His supremacy. Being infinitely elevated above the highest creature, He is the Most High, Lord of heaven and earth. Subject to none, influenced by none, absolutely independent; God does as He pleases, only as He pleases, always as He pleases. None can thwart Him, none can hinder Him. So His own Word expressly declares: “My counsel shall stand, and I will do all My pleasure” ( Isaiah 46:10); “He doeth according to His will in the army of heaven, and the inhabitants of the earth: and none can stay His hand” ( Daniel 4:35). Divine sovereignty means that God is God in fact, as well as in name, that He is on the Throne of the universe, directing all things, working all things “after the counsel of His own will” (Ephesians 1:11). We affirm that He is Sovereign in the exercise of His power. His power is exercised as He wills, when He wills, where He wills. God is Sovereign in the exercise of His grace. To declare that God is frustrated by sin, is to dethrone God. To say that God has no control over the bad things that happen in our lives is to dethrone God. We have lost our sense of God and His Sovereignty in our churches, our preaching, our Thanksgivings! Instead of focusing on God and His Sovereign Right to Act as His Nature Dictates, we focus on ourselves and we go “boo-hoo”, why did you do this why did you allow that. We are so man-centered, that every time something doesn’t go our way we shake our fist at God! When you learn to focus on the Sovereign Will of God, you trust in an all powerful God who works His Glory in whatever happens in your life! You know that nothing is by accident, that He is working all to accomplish what please Him, in accordance with His Word and His Nature! The whole issue is whether we live lives that are man-centered or God-centered. In the Book of Jonah we see an obstinate, self-centered man who runs headlong into the mighty Sovereignty of God. 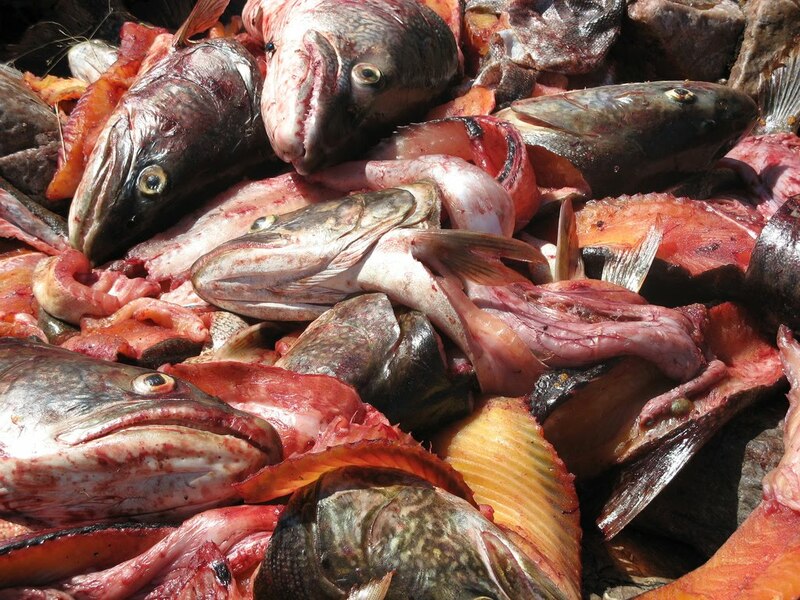 He was swallowed by the fish, held captive. Jonah centered world results in damnation. 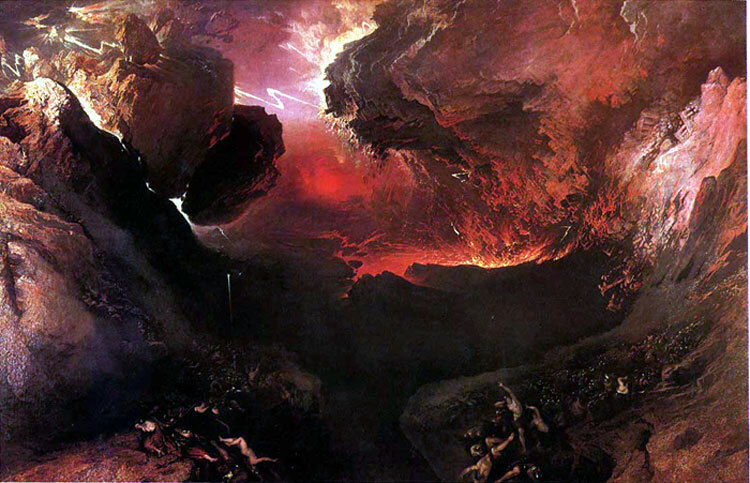 The people of Nineveh were doomed. Jonah centered world results in anger and hatred. Jonah was mad that Nineveh was saved. Mad at what God had done. Jonah deleverd from the Hell of the fish. Why Does a God Centered World result in Repentance, Deliverance, Mercy and Salvation? 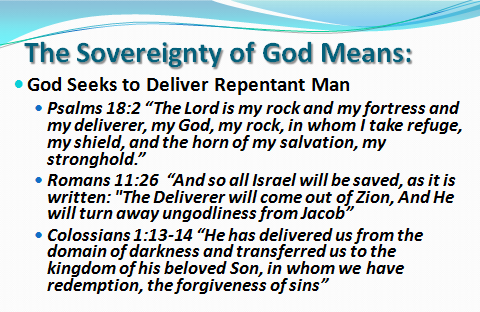 The Sovereignty of God means that God seeks to Deliver Repentant man. 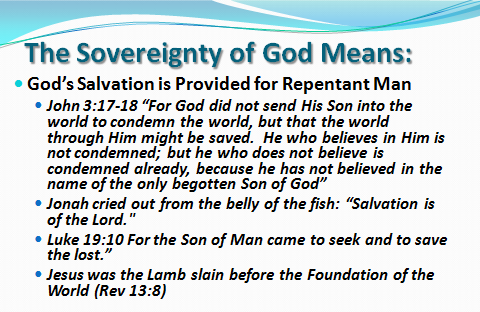 The Sovereignty of God means Salvation for Repentant man. We have so much to rejoice in. If you have turned from you sin and embraced Jesus as your Savior, Rejoice, you have been delivered, you are wrapped in the Mercy of God, You are being saved. Rejoice and tell your relatives – make em think you are crazy. Jonah was stinking like a fish when he told the people of God’s coming judgment. Rejoice because God is sovereign. Why don’t you put God on His Throne in Your Life!!! He is on His throne. Whatever you are going through, all you need to do is repent of your sins and rejoice in God’s Mercy. He will do all according to His Will. 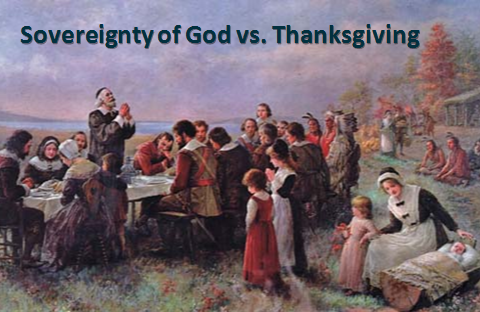 You can live this Thanksgiving Man-centered or God centered. You Can Brood and Burn in Pain! That little word angry is “hara” which means to cause fire to burn- pictures a “burning sensation in your throat.” This is a kindling or simmering of anger. When you put your self on the throne you set in motion the kindling of your soul as you react to what God does in your life. Instead of praise and spontaneous rejoicing, your throat is burning, your are mad and resentful because God has not done as YOU wanted. You can Seek God and BURN BRIGHT with Joy! Psalms 105:3 (ESV) Glory in his holy name; let the hearts of those who seek the Lord rejoice! You can realize God is Sovereign and is actively governing as He pleases upon His throne. 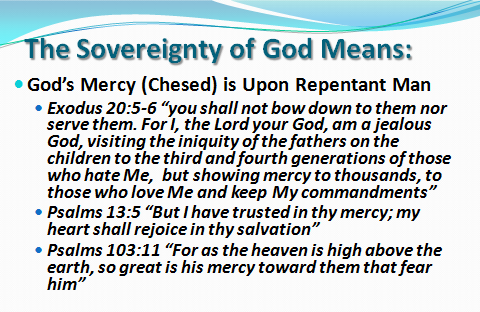 You can repent of your selfishness and sin and seek after Almighty God and His reign over your life. Then you will know SAMAH! SAMAH results in spontaneous emotion and extreme happiness which is expressed in some visible manner. Psalms 32:11 (ESV) Be glad in the Lord, and rejoice, O righteous, and shout for joy, all you upright in heart! The past few days when I’ve been at that window upstairs, I’ve thought a bit of the ‘shining city upon a hill.’ The phrase comes from John Winthrop, who wrote it to describe the America he imagined. 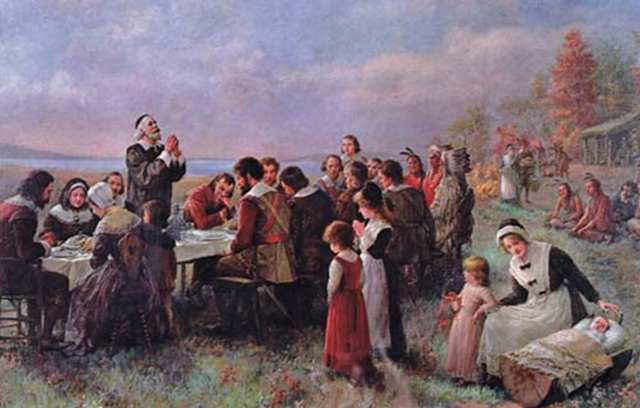 What he imagined was important because he was an early Pilgrim, an early freedom man. He journeyed here on what today we’d call a little wooden boat; and like the other Pilgrims, he was looking for a home that would be free. I’ve spoken of the shining city all my political life, but I don’t know if I ever quite communicated what I saw when I said it. But in my mind it was a tall, proud city built on rocks stronger than oceans, windswept, God-blessed, and teeming with people of all kinds living in harmony and peace; a city with free ports that hummed with commerce and creativity. And if there had to be city walls, the walls had doors and the doors were open to anyone with the will and the heart to get here. That’s how I saw it, and see it still. 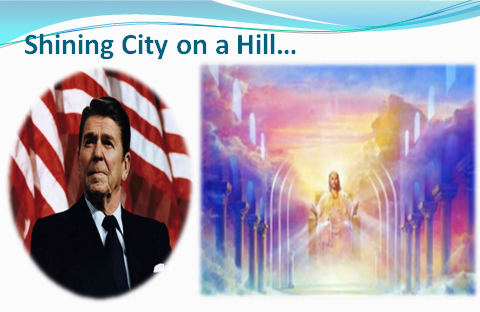 America may no longer be that shining City on the Hill, but God still Reigns. He still seeks men to repent and come to Him. 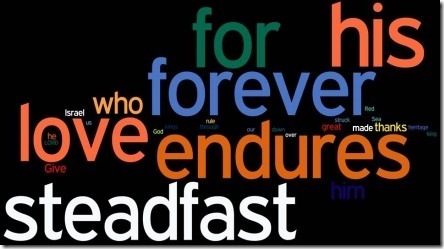 All the financial and political travail that is going on is the Throne of God giving us one last chance to Repent and Honor Him as Sovereign God! One day He will place His Son on that Shining City on the Hill, Jerusalem. All nations will come to Him there. He will reign. Do you know King Jesus as your Savior. Is His Father your Sovereign Lord? 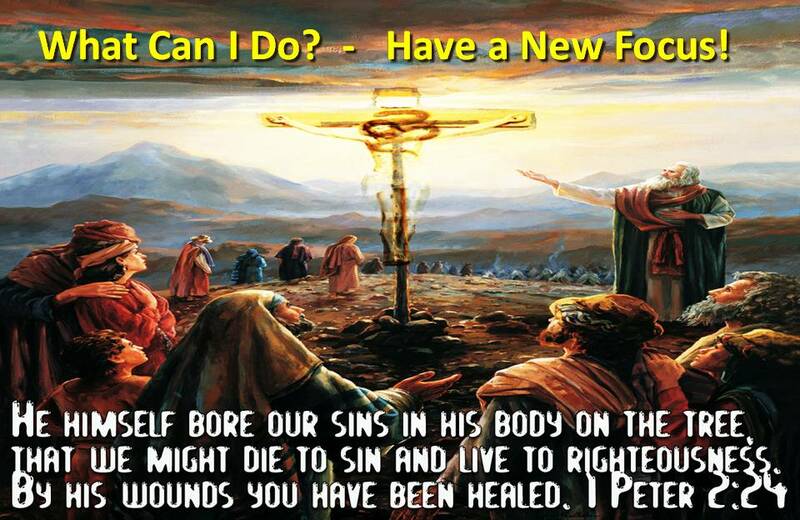 Jesus died on the cross to pay for your sins. He paid the price for your freedom with His precious sinless blood. Will you come to Him? Will you repent of your sins and say “Jesus I need you to be my Savior!” Will you come and make Him your Lord, so that He can shine bright in your life? God Still Reigns. 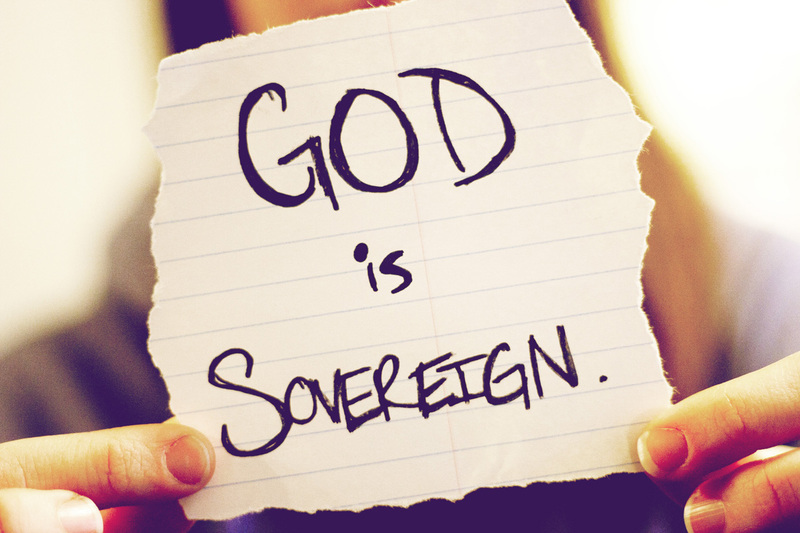 God is Sovereign. What will be your visible expression of joy before God this thanksgiving!!!! Will You allow God to be on His throne in your life? 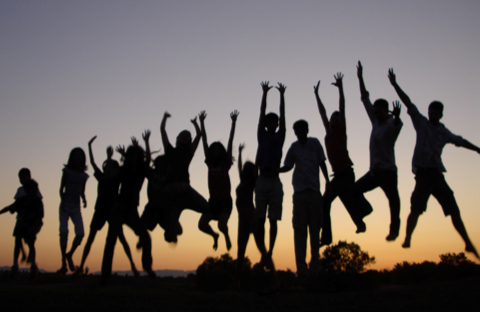 Will you jump for joy because of his deliverance, his mercy, his salvation for you? That which you think has most injured your life, God can enable you to rejoice in it, even eat it! Never fear it! Even if it swallows you!